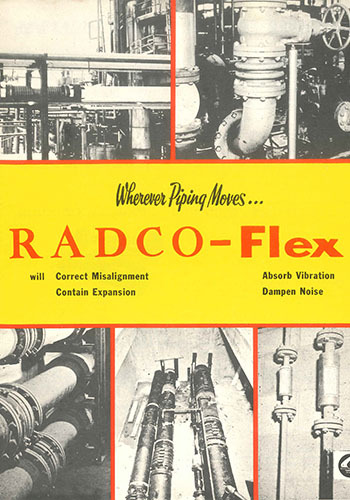 RADCOFLEX has, virtually from its inception, primarily been a manufacturing company, commencing with the fabrication of expansion compensators for pipelines back in the 1950s. 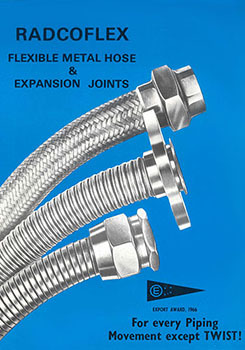 This was followed by metal flexible hose in the 1960s, wire braiding and metal expansion joints in the 1970s, composite hose and fabric expansion joints in the 1980s and automotive exhaust connectors in the 1990s. 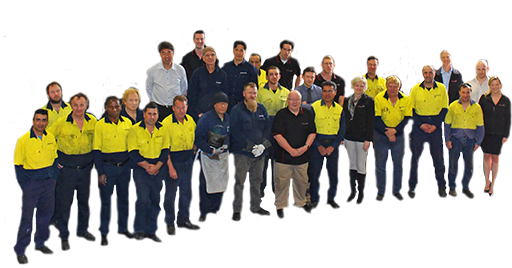 We continue to research and develop new products and manufacturing techniques with a number of our production machines having been built in-house. This background and our experience in the market place and its requirements, coupled with our own in-house engineering activities has provided us with a valuable insight into our industry. We are equally comfortable supplying a metre of hose, servicing a supply contract or completing a multi-million dollar project. 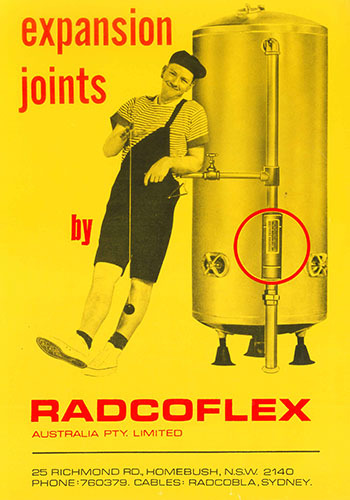 RADCOFLEX Australia Pty Limited founded in 1957 is the original RADCOFLEX company. 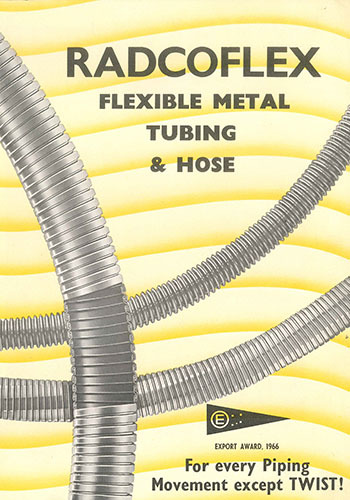 It is not to be assumed that the products manufactured and supplied by Radcoflex India are to the genuine proven RADCOFLEX Australia specifications. 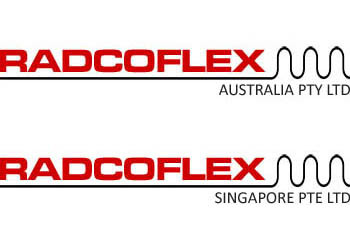 RADCOFLEX Australia is not responsible for the products of Radcoflex India and does not support any claims made by Radcoflex India. We at RADCOFLEX are fortunate to have a staff all wanting RADCOFLEX to succeed and they know that comes from giving priority to our customers and their needs. 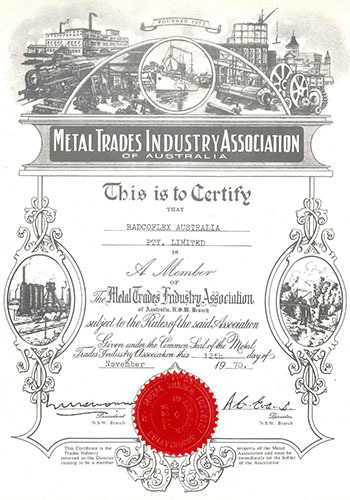 Our team includes professional engineers, trained salespeople, qualified welders and skilled tradespeople – a blend of experience and those familiar with new technologies yet all with a strong understanding of the importance of quality. 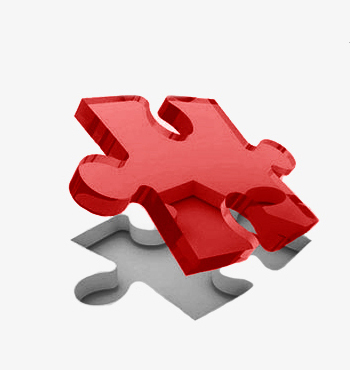 In addition, we have access to a number of international connections enabling us to find a solution to almost any problem or requirement in our field. We at RADCOFLEX are committed to meeting our customer’s expectations and requirements with a quality product and service. We also take seriously our aim to be a good corporate citizen, complying with our legal obligations, standing by our products, providing a safe working environment for our employees and end users of our products, being conscious of our impact on the environment, being community minded and above all, acting ethically. We believe that this continual ongoing attention to quality and our integrity has been a major factor in the growth of our business, creating a customer loyalty that outweighs price alone purchase decisions. RADCOFLEX are committed to providing a quality service in a manner that ensures a safe and healthy workplace for our employees and minimises our potential impact on the environment. We will operate in compliance with all relevant environmental legislation and we will strive to use pollution prevention and environmental best practices in all that we do. 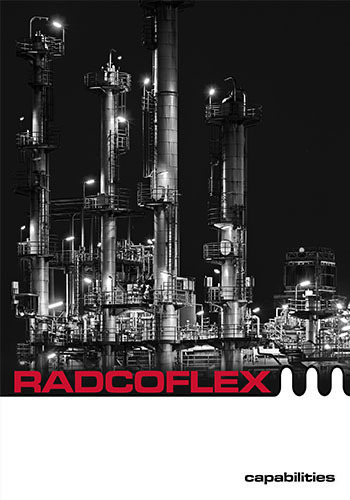 At RADCOFLEX we believe that we have the capacity to be profitable as well as sustainable for the future. Environmental and social conscious are intrinsically linked to finding innovative solutions to challenges that are ultimately and holistically beneficial for our business and the wider community. At RADCOFLEX we seek to integrate the consideration of environmental concerns and impacts into our decision making and activities. 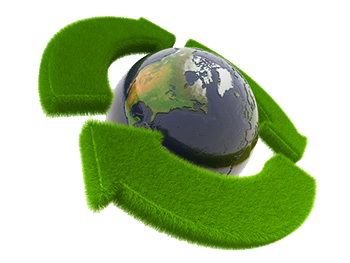 We aim to minimise our waste and then reuse or recycle as much of it as is possible. We aim to minimise energy and other resource use within our buildings and processes in order to conserve supplies and minimise the consumption of natural resources and ultimately our impact on the planet.